The expansion California Seals will apply to the Ontario Hockey Association to establish a Junior A developmental team in Guelph, Ontario. Norman (Bud) Poile, manager of the new team, made that announcement yesterday. The Seals are one of six expansion franchises awarded by the National Hockey League in February. The Seals presently play in the Western Hockey League and will move into the NHL in 1967-68. Poile wants to get a Junior A club up and running as soon as possible. He was in Ontario this week exploring possible locations for a team. We are anxious to start building our player system immediately. Guelph was a very successful Junior A city for the OHA for many years. The Guelph Biltmores began in 1948 and were a successful New York Rangers farm club until three years ago when the team was moved to Kitchener. The Ontario Hockey Association Junior Council announced a few weeks ago that it would be interested in expanding the Junior ranks to keep in step with NHL expansion. All nine present OHA teams are affiliated with the established NHL clubs. Toronto Maple Leafs defenseman Kent Douglas will find out his fate today. NHL president Clarence Campbell says he would like to make a decision today, he has been awaiting reports from game officials on a temper tantrum thrown by Douglas in a game Saturday night against Chicago. The incident arose during a skirmish between Douglas and Chicago’s Doug Mohns. Mohns broke away from linesman Neil Armstrong and was able to land several punches on Douglas, who was being held by linesman John D’Amico. Douglas became enraged at D’Amico and took a couple of swings at the official. 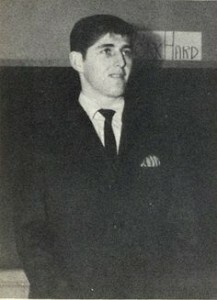 The punches did not connect and he was prevented from doing further damage by team mate Frank Mahovlich. Douglas was given a game misconduct by referee Frank Udvari. The Kitchener Rangers evened their Ontario Hockey Association Junior A semi-final series with the Toronto Marlboros last night. The Rangers edged the Marlies 4-3 thanks to some sleight-of-hand by the Rangers’ Walter Tkaczuk. Tkaczuk scored the winning goal in the final minute of the third period. He broke in with defenseman John Beechey on a two-on-one rush. Beechey had the puck and passed to Tkaczuk. Unable to find a clear shot, the Ranger forward, who normally shoots left, suddenly switched to the right side. 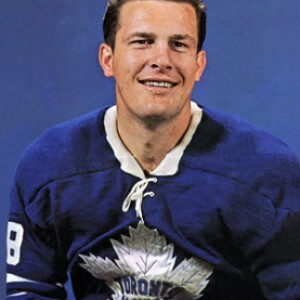 He skidded a shot right along the ice that eluded Toronto goalie Al Smith. That last-minute move sent the 4,338 Kitchener fans home happy. Up to that point the game had been a dull, scrambly affair in which the Rangers held the edge in play. Don Luce, Jim Krulicki and Gordon Kannegiesser had the other Kitchener goals. Marlie goal scorers were Terry Cafferey, Mike Corrigan and Gerry Meehan. The Montreal Junior Canadiens nipped the Oshawa Generals 2-1 to tie up their OHA Junior A Series at one game apiece last night at Oshawa. 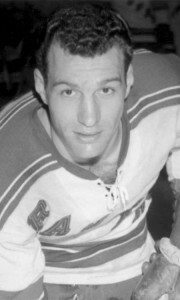 Montreal captain Jacques Lemaire scored both goals for Montreal. The young centre has been a dominant figure for the Junior Canadiens throughout the playoffs and last night was no exception. He opened the scoring late in the first period. He then potted the winner in the final minute of the middle frame. Bill White had the Oshawa goal early in the second period. The Springfield Indians dealt the Baltimore Clippers American Hockey League playoff hopes a severe blow last night. The Indians downed the Clippers 4-2 in Baltimore to take a six-point lead over them in the race for the final divisional playoff spot. 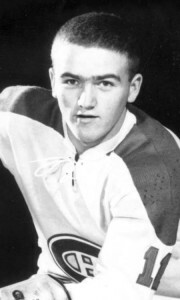 Springfield scorers were Brian Kilrea, Yves Locas, Roger Cote and Jerry Foley. Larry Regan and Jean-Marie Cossette replied for the Clippers. Montreal Canadiens defenseman Terry Harper has been cleared to play in Montreal’s next game against Toronto. Harper suffered a head injury Sunday evening against Chicago but has been given the all-clear to suit up against the Leafs tomorrow. Hamilton Red Wings have announced that general manager-coach Rudy Pilous will be back with the club next season. New York Rangers have returned defenseman Al LeBrun to Minnesota Rangers of the CPHL. Brian Morenz, the Oshawa Generals player who underwent emergency brain surgery on the weekend, is listed in fair condition and is expected to make a full recovery. Portland Buckaroos of the WHL will be without goalie Don Head for the next two weeks. Head suffered a torn groin muscle in a weekend game against San Francisco Seals. In a poll by Hockey Pictorial magazine, NHL coaches chose Leafs’ Bob Pulford as best defensive forward in the NHL. They picked Bobby Hull as fastest skater and hardest shot. Gordie Howe was best stickhandler and most accurate shooter. Bobby Hull is the NHL’s leading scorer in the second half of the season. Toronto’s Frank Mahovlich is second. Detroit Red Wings have called up Peter Mahovlich, younger brother of Leafs’ Frank. Pete played for the junior A Hamilton Red Wings who were eliminated from the OHA playoffs last week.